A top quality versatile chimney system offering a single solution for all today’s combustion requirements. A multi-fuel application product for solid fuel, high efficency condensing applications or all the latest biomass products. Since it has diameter range of 13 sizes from 100mm to 600mm it is perfect for both commercial and domestic applications. A 316L inner along with 25mm high density insulated annulus and a 304 stainless steel outer case built to last. Designed with a rapid fit barbed twist lock joint system which is both durable and strong allowing the system to fress stand up to 3m above the last support. The system can be retrofitted with seals allowing 200pa of positive pressure and a resistance to corrosion. We also offer the Negara Twin Wall System as an alternative. All twin wall chimney systems must be installed to comply with part F of the Building Regulations in Scotland, as well as to the flue manufacturer’s installation instructions. The flue should remain as straight as possible and be high enough to ensure sufficient draught to clear the products of combustion. The height necessary for this depends on the type of the appliance, the height of the building, and the number of offsets within the system. Building regulations however recommend a minimum flue height of 4.5 metres be achieved. Where it’s not possible to construct a vertical chimney, Building Regulations say that no part of a chimney should form an angle greater than 45° from the vertical, except where it may be necessary to use a very short horizontal section, not exceeding 150mm, of flue to connect the chimney to a back outlet appliance. The run between offsets shouldn’t exceed 20% of the overall chimney height. In both cases a maximum of two offsets in any one chimney run should be used. Cleaning access must be provided in chimney systems with two offsets. It’s also recommended that a vertical rise of 600mm be allowed, immediately above the appliance before any change of direction. Where the flue passes through a combustible floor or ceiling, an air gap clearance as per the manufacturer’s installation instructions must be maintained. In multi-fuel applications and where the flue gas temperature is greater than 250°C, the ventilated fire stop and ventilated support components must be used at the bottom and top of the shaft. In the case of oil and gas applications where the flue gas temperature is below 250°C or where the chimney passes through a non-combustible floor the standard fire stops and support components can be used. No joints can be made within the thickness of any floor or ceiling joists. The twin wall chimney system must project below the ceiling in accordance to the diameter of the flue pipe. Use of an adjustable length within the flue pipe connection or twin wall chimney system immediately above the appliance, enables removal of the appliance later without dismantling the full system. In the room where the appliance is installed, provision needs be made for an air vent. This is required to provide adequate air supply for the appliance and flue to operate efficiently. These requirements are specified in the Building Regulations. When a flue passes through an external wall, a wall sleeve must be used. The diameter of the chimney system should be as recommended by the appliance manufacturer and in most cases won’t be smaller than the appliance outlet. 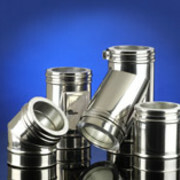 Confirmation from the manufacturer will be required if you reduce the flue size. Flue sizing for commercial applications will depend on individual site details and must be designed and sized in accordance with manufacturer’s criteria. We will advise you on the correct size for your appliance. For inglenooks with openings larger than 500mm x 550mm, a flue size with a cross sectional area equal to 15% of the total face area of the fireplace opening will be required. On multi-fuel or wood burning closed appliances with an output of up to 30kw rated output, the minimum flue size must be 150mm internal diameter. Load bearing supports such as wall supports and Ceiling/Joist supports are required to take the vertical weight of a twin wall chimney system. Non load bearing supports like wall bands and roof / rafter supports give lateral support throughout the chimney system. Wall bands need to be fitted every 3 metres and where the chimney offsets to ensure the system is adequately supported. When the chimney is free standing above the roof line a height of up to 3 metres can be achieved unsupported with the use of a reinforced or extended locking band at the joint immediately below and every joint above the roof level. Provision should be made for inspecting and cleaning the chimney. It is recommended that chimneys serving solid fuel appliances be swept and maintained as frequently as necessary; at least once a year.